Last month I started out by saying that March looked like it was going to be great. Turns out it came in like a lamb and went out like a lion. My husband Don has been having trouble with his eyes for quite a while. For several years he’s been on glaucoma watch, and the disease has been very well controlled until recently. He developed a leaking blood vessel in his right eye a few months ago and started having to have shots in his eye every couple of months, which is gross but seemed to work. So Don decided to start the search for another glaucoma specialist and made a couple of appointments with new doctors, planning to choose one after checking them out. But then on March 21, a day before exploratory appointment number one, his one good eye went all fuzzy and a trip to the new eye doctor (whom we really like, fortunately) showed that his left eye pressure was in the eye-explosion territory, resulting in another emergency eye surgery on the 22nd. After the surgery, he was not able to see clearly out of the operated-upon eye, which meant he couldn’t drive or read. Things were getting worse instead of better, and of course the new surgeon had gone on on vacation to Europe. So we called his office and they referred us to another glaucoma specialist, who did some voodoo and told us that if things didn’t improve soon he’d have to have another operation. As it turned out, New Doctor in Europe and Newer Doctor in Phoenix actually consulted over the phone (technology is wonderful) and we did indeed have to drive up to Phoenix for another emergency surgery. We are told it went well. New Doctor is back from Europe and we saw him this morning. 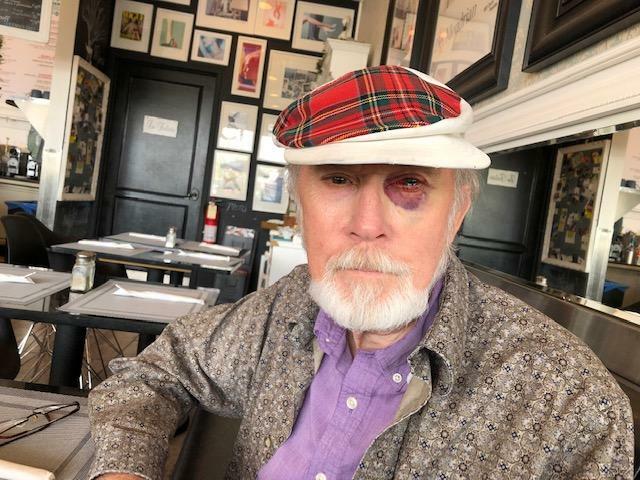 He says that The Eye may be all beat up, sore, and fuzzy, but it should heal all right and Don will be able to see clearly out of it once the trauma and swelling settles down. In the meantime, Don is his usual sanguine self, except that he is still temporarily unable to read or drive, so Yours Truly is at the moment a full time chauffeur/human Kurtzweil machine. As I’ve mentioned on Facebook (which by the way, I’d love to be your FB friend at Donis Casey Author), Don has had innumerable health problems over the past decade which have interfered with my ability to travel and promote my books in person. Therefore I really need to learn how to be better at promoting online. So I’m soliciting ideas, Dear Reader. What kind of online promotion do you think would be effective? What might entice you to pick up a book or read an author you have never read before? I’d be most grateful to know. This entry was posted on Friday, April 5th, 2019 at 5:36 pm	and is filed under Uncategorized. You can follow any responses to this entry through the RSS 2.0 feed. You can leave a response, or trackback from your own site.